We've entered the computer age . . . ready or not! Many of today's children live and breathe technology. But even if they've been playing video games since three years old, they don't automatically know where to put their fingers for efficient typing. This is something that needs to be taught. Type Write Touch Typing is a beginning typing program, for kids in upper elementary or middle school. The home row (middle row of keys) is introduced first. Then other letters are added one at a time, while continually practicing the letters already learned. Each new letter has 3 pages to use for typing practice: letter blends, words, and short stories. 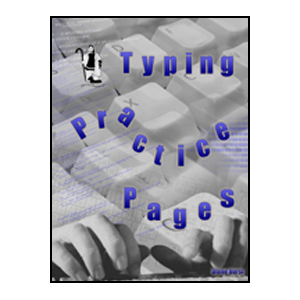 This ebook has 71 typing exercise pages to be printed out and stored them in a manila folder (this allows the student to easily go back and forth between pages-- they are not always used consecutively). Pages can be put on a propped-up clip board or small easel next to the computer, to look at while typing. There is also a syllabus that tells which pages to type each day. On most days, two different pages are typed; this takes around 10 - 15 minutes. PDF ebook with syllabus, 71 printable exercise pages. It takes half a school year to do the exercises in the syllabus; this introduces the basics of touch typing, covering all alphabet letters and some punctuation. Type Write starts with only the keys on the home row (middle row of keys). Then other letters are introduced one at a time, while continually practicing the letters already learned. In practicing the letters, students type lots of actual words (nonsense syllables have been kept to a minimum) and special short stories-- that go with the letters being introduced. The sentences are generally in the form of a short story. For example, the sentences for letter "u" tell about a car: "The car's trunk clunks shut. The car's key turns. The car's engine runs. The car puffs fumes and charges ahead in the blinding dust." The use of meaningless nonsense syllables is kept to a bare minimum, which can help to make beginning typing more enjoyable and interesting for students. to train their minds and fingers, and increase in typing speed. 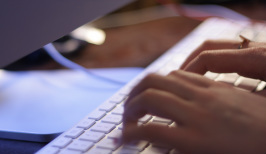 But how to provide assignments for regular typing practice? PDF ebook with instructions and 93 printable pages. Typing Practice Pages works well as a sequel to Type Write Touch Typing, though either book can be used alone. Each book takes half a school year to complete, so using both books together provides a full school year of typing activities. 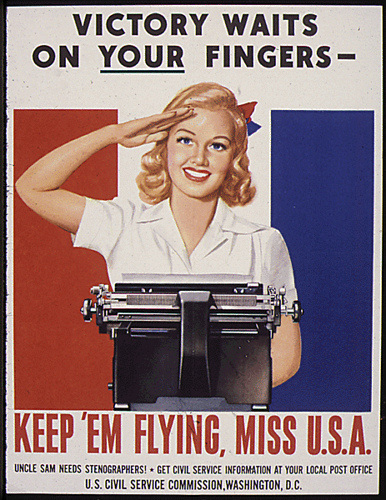 There are many excellent typing programs available, some using computer software, and some using printed materials. Why another learn to type program? For me, it was basically a user dissatisfaction issue with the program we had been using. My older kids were using one of the computer-based courses. Being very unfamliar with this method of typing instruction (in my high school class, we had learned to type on "modern" electric typewriters, using stand-up typing instruction books), I had decided to try out some of the typing exercises for their computer-based course myself, to see what it was that I was asking my kids to do. The games were kind of fun-- trying to race to type words falling from the sky, and things like that. But the basic learning-to-type practice exercises were something I myself just couldn't stand! They were supposed to type various nonsense combinations of letters over and over and over, and at the beginning there were no words, let alone the opportunity to put words into a sentence. Maybe this was more boring for me because I already knew how to type :) But I knew the beginning to type process could be made more interesting. So I set out to make some exercises that would teach beginning typing while still allowing the learner to type real words, and to use some of the words in sentences, and to use sentences together as entertaining stories. 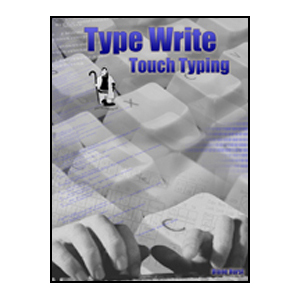 Many months later, after drafting the exercises, trying them out, trouble-shooting (by my kids and others) and revising, the Type Write Touch Typing e-book was born!